Since the early 2000’s Post Scriptvm are a project who have gained positive underground recognition through their distinctive style; a sound which encapsulates a dissociative paranoid tone and skirts the border regions between dark ambient and industrial spheres. 2015 brings two additional vinyls to their discography, with the first being a repress of their debut album released on limited CDr in 2002 on the long defunct American label Somnambulant Corpse. The second release is a new collection of live recordings from the group made between 2003 and 2014 spanning various live performances in Oakland, Brooklyn, Antwerp and Poland. In line with the Tesco Archaic Documents label agenda, ‘Gauze’ has been given the reissue treatment on limited edition heavy weight vinyl, with new updated artwork which is much more fitting than the original packaging. Musically speaking ‘Gauze’ is far less refined than later works from the project, rather choosing to wallow in death ambient/ death industrial mires. On the opening cut ‘Cunctator’, the sparse, doom tinged and throbbing atmospheres give way to fleeting fragments of sampled choral vocals which cut through the dank suffocating ambience. ‘Trepan’ contains more thickly muffled deep-shaft/ bunker styled murky ambience with touches of mechanized clatter, as a lone warbling voice intones a mood of post-destruction desolation. ‘On the Brink’ is framed around a haze of intertwining mid-toned drones, giving way to distant windswept field samples, which leads into the following track ‘Pore’. This final track for side A is announced by a distant air raid sirens, as an assemblage of cavernous metallic clatter provides loose pounding rhythmic structures of a death ambient/ industrial styling (which hits its mark excellently). Moving onto Side B ‘The Binding’ is more direct in its industrial expression, with a grinding pulse and consistent, static charged thunder claps, but soon enough the piece pulls back in tone to wallow in death ambient obscurity. The following and relatively short ‘Vox Calamantis’ opts for washes of aquatic toned layers to underpin its mid paced ominous rhythmic thump, further awash with prominent dialogue samples and organ styled dirge. ‘Gentle Diversions’ as the concluding piece rounds out the LP with ominous and paranoid death ambient soundscapes (a suitable blend of radio static drones, garbled vocalisations and muffled lurking terror). Moving onto the live collection of tracks which make up ‘Séance’, from these recordings it noticeably demonstrates that in a live setting Post Scriptvm take on a much heavier and focused attitude. Whilst specific tracks and musical segments are clearly recognizable, they are also pushed into more weighty sonic realms. Examples of where this is evidenced includes ‘Upon Decadent Scum’, where the forceful grinding layers and heavily treated vocals encompass a forceful heavy electronics tone; as does ‘Ruins of Men’ with its thick, pulsing bass and clinically edged tones and synth washes. The paranoid infused industrial tinged dark ambient sound is then on full display with the live rendition of ‘Corners’ (from the latest ‘Benommenheit’ album). Being a faithful yet slightly rougher and less crystalline live reproduction, it is an excellent example of the wonky and dissonant industrial atmospheres that Post Scriptvm have made their trademark. For the final of the 8 tracks features as ‘Exacerbation’: a forceful piece which verges on the structured and direct style of Ex.Order’s power electronics. Here wailing sirens, heavy grinding/ pounding elements, buried samples and distortion spat vocals make for a very engaging blend and ending to the LP (whilst the rousing crowd applause at its conclusion also highlights its reception in a live setting). 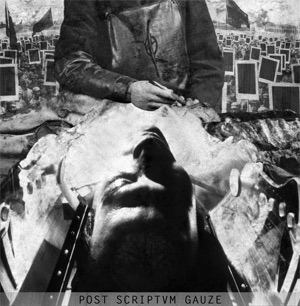 In comparing the two releases, whilst ‘Seance’ may be the album which is representative of Post Scriptvm’s sound today, ‘Gauze’ is still a very solid album in its chosen style of obscurity tinged death ambient/ death industrial reveries. With reference to the number of excellent prior albums issued over the past decade and half, these new and strikingly presented vinyls equally function to please existing devotees, and further elevating the underground profile of Post Scriptvm. 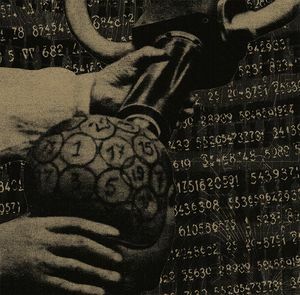 This entry was posted in 2015, dark ambient, death industrial, heavy electronics, industrial, power electronics, Tesco Archaic Documents by noisereceptor. Bookmark the permalink.